First of all I stamped the gate with Marvy Brush Markers on watercolor paper, applying the ink right to the stamp using the side of the marker. I then used a small brush, dipped it in water (removing most of the water on a rag) and brushed over the lines that I had stamped. I duplicated these steps with each part of the picture to give it the water color effect. A strip of white lace was attached under the paisley paper although not much of it really shows because the stamped image covers it up. 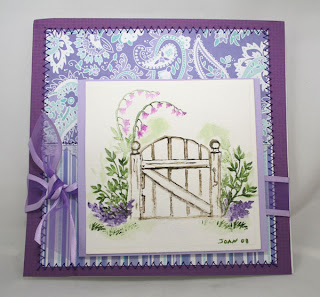 I zig-zagged around the stripe and paisley patterned paper attaching it to a dark purple card stock. I added a lavender sheer ribbon and popped the picture with 6 dimensionals. I didn't stamp any words as I wanted to keep this for any occasion that comes up when I need a card. Joan this is absolutely fabulous! I used to be an Art Impressions addict when it came to their watercolor series. I have every one almost from the first round of stamps! You did a fabulous job! This is SO beautifully watercolored, Joan! Very nice job on the new technique! Your card is so, so pretty. Gorgeous, Joan -- truly wonderfully done -- I MUST find time to try this out!!! Just love it!!! The watercoloring is beautiful. I love that gate stamp!